Regular cleaning is pretty common in an office building.Cleaners come in to do the bathrooms, sanitize surfaces, and even clean the floors.However, there is a common area that many overlook when cleaning—your furniture. Many companies don’t even think about getting the upholstery cleaned on their office furniture until something happens like a spill. 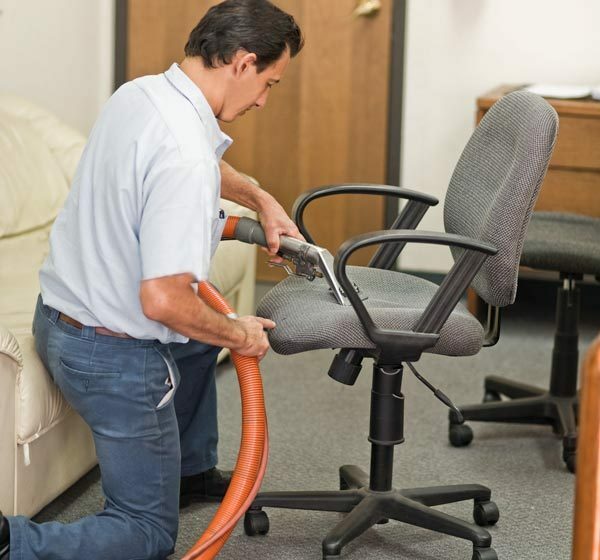 The thing is you should be having commercial upholstery cleanings done regularly,not only for your business’ appearance, but also for your employee’s health. Cleaning upholstery regularly does more than make your office look good. It can also extend the lifespan of your furniture. Cleaning your furniture can help restore the life and elongate the time spent with that furniture. Fewer furniture replacements, more money savings for you! Regularly scheduled commercial upholstery cleaning can also promote a healthier office environment. The upholstery on furniture can collect dust, dust mites, allergies, and more. If these surfaces are never being cleaned, it can impact the health of your employees. Keep your air clean and rid of allergens by not only cleaning your upholstery but also with regular commercial carpet cleaning. So, you’re interested in commercial upholstery cleaning but you aren’t sure when the right time is? Well, it can largely depend on the type of business, the size of your company, and the type of furniture you have. We recommend cleaning your upholstery at least every 6 to 12 months. We always start by thoroughly testing the fabric to make sure we are using the safest and best procedure for the particular type of fabric we are working with. We then take special precautions to protect the floor and other furnishings in the area and set up our “Cleaning Area”. An important aspect of the cleaning area is the drying mat. We place a furniture blanket on the floor and place an air mover to blow air across the surface. As each cushion is cleaned, it is placed on the drying mat and rotated until it is dry. We also take special care to wipe down any wood or solid surfaces and protect any metal buttons from the damp fabric. If your company is interested in cleaning their commercial upholstery, please call Big Red’s Guaranteed Clean at 402-390-9526 or contact us online. We have what it takes to properly and affordably clean your commercial upholstery. ‹ Spruce up your Business with Commercial Carpet Cleaning!